With great pleasure and unanimous agreement, the jury of the Ultimas selected Marc Dubois as the winner of the Ultima Architecture 2018. Since the end of the eighties, Marc has occupied a unique key position in the Flemish architectural landscape. During a period of ‘wasteland’ in the field of architectural policy, even before the position of Flemish Government Architect was created, he was one of the voices advocating and actively promoting the internationalisation of Flemish architecture. For example, in 1991, together with Christian Kieckens, Marc organised the first Flemish architectural exhibition, ‘Architects from Flanders’ for the Venice Biennale. In 1996 and 1998 Marc was also director of the Biennale Interieur in Kortrijk. 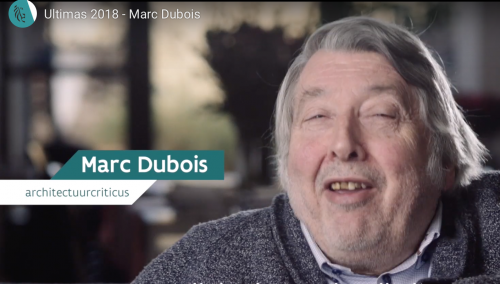 According to the jury, this pioneering role is at the basis of the success of Flemish architecture today: In the 1990s, Marc helped to create the conditions that enabled many famous agencies of today to grow and flourish. He also inspired many generations as a teacher at Sint-Lucas. He has the gift of helping students to truly enjoy architecture and for inspiring enthusiasm for their future profession. Through his numerous lectures to a wide audience, he helped put Flemish architecture and its attention to quality in the building process on the map. To the jury, the quality of his texts and blogs is in their accessibility. At the risk of using a buzzword, Marc is a networker pur sang. Communication is important, and he is in constant contact. He has a nose for interesting encounters and brings people from different spheres, almost casually, into contact with each other. Marc has opened many doors in this way. The jury also praised Marc for his critical activism: he stood, and continues to stand, on the barricades for high-quality architecture, aesthetics and the recognition of the architect’s work as a creative process. He also dares to manoeuvre politically and if necessary make trouble if a particular project is close to his heart. To this day, Marc continues to possess that focus and drive. In recent years this has been reflected in his efforts to secure archives. In short, Marc breathes architecture. This is perhaps best reflected in his postcards, which he collects everywhere and sometimes cuts and pastes onto his own creations. These cards, with encouraging words and thoughts on the back, show how generous Marc is with his insights and knowledge. Quote: The jury therefore wholeheartedly honours Marc for this life of ‘sharing about’ and ‘sharing of’ architecture.